Okay, I've been wrestling with these spreads. Yes, I know how to make money on these, but what happens when your position goes against you and at which point do you get out? Since I'm a chartist and mainly do my trading right off the price charts, finding support and resistance is my game. Let me recap briefly about when to use BUPS and BCS. That really is the picture and simply when these credit spreads are used. If anyone has comments, suggestions, insights, feel free to chime in about what I'm writing. It seems I've been doing more BUPS lately, so let's say for purposes of this blog entry, we'll focus on BUPS. If it bounces off support, you put on a BUPS at the nearest strike. This could mean that as it bounces off, you are ATM (at the money). As I'm a student of Ryan's, this is typically what he would do and I am his protege. I would be selling the closest strike and buying the next strike down. Now, those are obvious things to those doing credit spreads, but this is for the sake of talking things out in my own head and own understanding. My thoughts are that I DO NOT have to hold until expiration. If I have 60+% of my credit has already decayed with 3 weeks left until expiration, why would I want to wait for the other 40%. Most likely I had gotten a really great premium of 40+% of the money on hold, so even if that ends up being 15-25% of the marginable money, that is STILL a great return. That frees up my money to jump into another spread OR another play period. That 60% figure is something that a friend of mine does, and Ryan also says something similar. So, 2 people whom I greatly respect do this and are successful at it, why would I want to reinvent the wheel? So, when are times to get out of my position? Allow it to go ITM, because much of the time, it will go back OTM and with time decay (unless volatility is high), you'll be able to get out for less and hopefully still keep some of your credit or this will at least cost you less. However, if you have the stock put to you, this is a different story, so this is probably a fairly dangerous move. At any point it's >60% of your premium has decayed. Do you close out the whole spread or just the short side? You have to look at how much the short side is and see if it's going to be super costly to get out with just the short side. Maybe closing the whole BUPS would reduce your costs. This really is a case-by-case scenario. If the stock is dropping like a rock, even if it's costly to close the short side, you may still do this and let the long side ride, to make up for some of the cost of the short side. However, this is where good chart reading is beneficial. 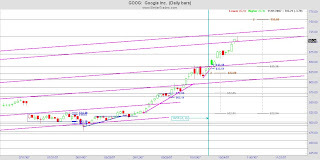 We never know exactly what the stock will do, but you can see the patterns. If another support is very close by, the stock could bounce off that and where you thought you would be making money on the long side, you may not. Anyway, I don't have a good answer for this, as this is something I'm wrestling with right now. As usual, this is not advice, rather me sharing some of the process I'm going through to learn to be a good trader as well as consistently profitable amidst the plethera of things I have going on. Never trade with real money until you have sufficiently practiced trading a strategy and are doing it very well. The market does not care who you and I are, and could care less whether we make money or not. It is always right, remember that, and it's best for us to keep our opinions out of the market, and just go with the flow, whether it makes sense or not. I will be sharing, if time permits, my credit spreads for this month. I've put some already on, and will put more on. These are all real time practice trades I am doing on TOS. I've found it's best to not put on an practice trades size positions that I would not do in real life. What that means if I'm going to use $1K per trade, keep with that and don't put on a trade that is $20K in practice because that is not what you'd do in real life. You want to be able to seamlessly move between practice and real trading. One will typically do better in practice than in real trading, so the closer you can bridge this gap, the better this will make your real trading. I know it does for me, too. And, it's important to review profitable & costing trades to see how you could better trade. Document/journal. And, I do continue to practice trade my normal trading because it's very easy to deviate from the things you know you should be doing, like setting stops/managing risk and get caught up in emotional frenzy, both to the good and bad. I am learning to moderate my emotions in trading, neither getting really excited or really down in the dumps. Not there yet, but working on it. As for my personal life, there is a lot going on there and it can be rather challenging. So, in more challenging times, I am not putting on any real funded trades, as this is often a surefire way to lose money. Patience in trading. Let trades come to you. EVERY day there are good trades with the stocks I trade, so no need to force myself to trade in conditions that are not good. Hey, everyone may be making money, but if personally you're sick, have a lot of havoc in your life, it's not a good time for you to trade, so stay out. The market will still be there when things have settled down. I'm learning this from firsthand experience. In the near future, I may offer some DVDs for sale to help in your own trading that are affordable. No, they won't be for $9.99, but more, but still reasonably affordable for many people, maybe not all people. But, if you're serious and want to learn, you have to spend some money. I basically spent about a year's engineering salary in my formal trading education, and the sacrifices I had to make to do that, as I have a family and financial responsibilities. Here are a list of China stocks that I looked between 80-100 and these are the ones with the best charts, sufficient volumes, and were optionable, IMO. They all trade either on the Nasdaq or NYSE. They all have identifiable trading patterns and quite a few right now are trading in pennant wedges or descending/ascending wedges - compression patterns. So, these would make great stocks to play for momentum plays, as breaks provide opportunities for getting in when volatility is low and as momentum picks up, so does volatility, which means if you're buying, this is great. 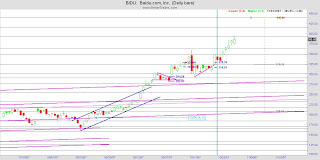 I did not look at which stocks had more fairness in pricing their options, but I can tell you that BIDU often is not fairly priced, but a stock that is on fire like that, you would expect the volatility to remain high, and you can STILL make money. Love this stock. Okay, love is a strong word, but this is a wonderful stock to trade, if you can stomach the moves. This isn't written by me, but was an article by Price Headley forwarded to me. I do keep a trading journal, but I would have to admit over the past 6-9 months, this has not been as consistent as I've been working to find a way to better do this with all that I have going on, so this continues to be something I refine. My tendency is to make things complicated, but simple works best, because that is consistently doable for busy people. I trade not only to make money, which is the first goal, but also to learn about myself. Trading gives us lessons not only about what to do or not to do next time in a trade, but also Life Lessons about personality traits that could improve the rest of our lives too - IF we are willing to work on them. Like all habits we form, change takes time, and we must commit to improving one element of our trading personality at a time, with total focus. Journaling can help identify goals and issues, as well as track progress (continued below). What does your Trading Journal look like - or do you not have one? It is critical to keep a Trading Journal. Yet statistics show that 97% of people do not have written goals, so why would a written journal be much different? In my journal I ask myself every day "Did I execute my trading plan properly?" If I did execute my plan correctly but I lost money, I give my trading that day a Plus. If I did not execute my plan, even if I made money, I give my trading a Minus. I also ask what caused me not to execute my plan. Was it lack of confidence in the system, fear, distractions, or something else? I then write out a positive solution regarding how I can fix this in the future. I also write down if I override any of my rules. I have generally found that my ego-based decisions to tinker with my system added little value, and often hurt more than it helps. The ego wants to feel like it is adding value on top of the system, to make the trader feel important. I believe that trading for ego satisfaction is probably even more damaging than trading for entertainment or excitement, as the ego risks getting damaged by the financial fallout that can occur. In my Trading Journal, I also note any insights on the current market, patterns that are working or not working, and other issues I encountered. I also list in my records my thoughts, feelings, ideas for improvement, strategies that did or did not work, etc. Reviewing your entries and exits in a trading journal helps you identify your strengths and weaknesses. In my Trading Journal I like to go back and look at my trades over the last month, to see how they subsequently performed. If I sold too soon, I want to find out why. Besides the daily observations, I commit to doing a post-trade analysis every month at the end of each month. I note what I did right and wrong, and seek to learn from mistakes to minimize future errors in similar circumstances, while also looking for winning patterns where I seek to repeat big successes. I call this a Success Profile. Be honest, and ask good questions: "What worked? What will I do differently next time?" Write about your thoughts, feelings and behaviors to see if you can spot patterns. Also keep notes on your trades you liked but didn't make. What held you back? Do you notice any patterns there that are causing you to miss opportunities? Look for patterns among your non-trades too to see what you are missing. One of the daily notes I like to make is to ask myself, "How Do I Feel Today"? In three primary categories: Physical, Emotional and Spiritual. I grade myself from 1 to 10, with 10 being best, and I write a note to myself about why I feel positive or negative in each category. There is no science in this case, but more of a personal 'gut' sense of where my mind, heart and soul are at on a given morning. Not surprisingly, some of my best days have correlated with scores of 26 or better, while I find that any total score under 24 is not very conducive to sharp, focused trading. The key if you score yourself low in an area is to then ask "Why?" and "What can I do to feel better now?" In some cases, if I feel sluggish physically, I have been known to get out of my chair and do jumping jacks and push-ups. This may sound silly to traders used to sitting for long periods, but I prefer to boost my self-esteem by even marginal exercise if I need it to feel better about myself, in additional to any physical benefits. Both positive and negative emotions seem to translate into trading. I will journal to improve how I feel about an emotional issue, and if I feel spiritually malnourished, I will take time to pray and meditate. The bottom line is that whatever gets you feeling better about yourself will tend to make you a more confident and focused trader and investor. I listed 7 Dec BUPS that I did 3 days prior to expiration. They were all sitting on support and if under certain conditions they went above certain prices, I decided I would get in, and so I did. After I listed the BUPS in my trading blog, I saw another one on PCU and entered that trade shortly. None of my stops for these 8 BUPS got triggered. The market was overall bullish, which really helped. Prior to the market open today, I entered orders to close all the short sides by entering a limit order to sell @ $0.05. Most of the order got filled within the first hr of the market, but a couple did not until later (MA and SPWR). Commissions for me were $2.95/contract, with a total of 30 contracts, 2 orders to get in, 1 order to buy back the short sides, that was $265.50 in commissions for these 8 BUPS. Buying back cost $150. Note: These are all practice trades done real time on the Think or Swim trading platform. I did do 2 other spreads that were not successful. One was a BUPS on RIMM that was Dec 100/95. After getting into that last week, on Wed it went ITM, so I bought back the Dec 100P. It was still a successful trade as I traded my plan, which was getting out if it went ITM. Of course, if I would've stayed in another day or so, this also would've been a successful BUPS. But, the thing here is that my stop WAS triggered and I took myself out of the trade, because it was a thing of discipline. I did have 2 BUPS on RIMM. Dec 100/96. ** and Dec 96.**/93.**. The mistake I made here was buying the 96. ** on the first spread was fine, but in the 2nd spread, I sold the 96.**. That was not well thought out until I looked at my TOS account and wondered what happened to my position. TOS does not allow BTO and STO, whereas my funded account broker, BX, does have that so you would not have a "canceling" type thing going on. Anyway, so the spread actually became a Dec 100/93.**. Not what I was planning on. I did have a BCS (Bear Call Spread) on CLF, Dec 105C/100C. I also started this last week and everything was fine until yesterday 2 hrs before close, the position started to show signs of bullishness. Also, not a good thing, but my stop that was at $99, was not reached, but getting close. Today not only was my stop triggered, but it went ITM, so I bought back the Dec 105C. This was also a successful trade, just not profitable. All these were entered in today a little after 1 hr into the market. The only reason for that is because I had to take the kids to school and get some things situated at home. Didn't go to bed until 2 am and I was a bit groggy when I got up at 6 am and spent the time with my daughter, who was also up early. Otherwise, I probably would've gotten filled with better credits than what I did. Still 14% ROI in just 3 trading days for spreads is awesome. Note that for those who do not realize this, Bull Put Spreads (BUPS) are for a bullish play. As of the writing of this, the market ($SPX) has been both bullish and bearish today, a little over 2 hrs into the market. What is it going to do? I have no idea. The stops I have for getting out of my positions are to BUY BACK the side I sold and let the side that is bought run. That stop has been placed as contingencies in all my trades and I will after this entry go in and put a trailing stop for the side that was originally bought that I will look to sell, if my spread does not workout. For those who do not understand, let me quickly explain. 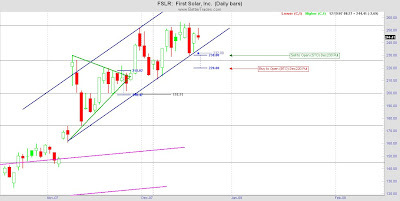 Here is the chart on FSLR. In a BUPS, here you would want the stock to stay ABOVE $230. As long as it stays above that to expiration (the third Saturday of the month), you get to keep the credit, which in this case is $0.95/share. I bought 5 contracts = 500 shares, so this would be a credit of $475. How a credit is determined is when you SELL, you take in money. When you BUY, you spend money. 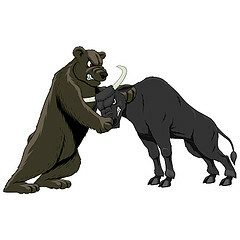 In either a Bull Put Spread (BUPS) or Bear Call Spread (BCS), the point at where you do NOT want the stock to cross, that is the side you SELL and the other side you BUY. A BCS is the opposite of a BUPS. You want to use this when the stock looks Bearish. So what happens IF the stock does drop down below $230? You will have to BUY back your Dec 230 Put position. Right now, it would cost me $1.55 to buy the position back. Yes, buying it back costs more in this case than selling it. It would've cost me $0.10. If the stock drops to where I am to get out, that will cost me even more. Then, I would let the other side, the Dec 220 Put position run. Of course, you have to get out of the position by the end of Friday because these are December options, so remember that. In order to break even, you will have to add the cost of the difference of the Dec230 Put Sell & Buy back, plus the cost of the Dec 220 Put. Anything above that is profit. You would close out the spread with 1 order where it simultaneously fills you for the buy back of the Dec 230 Put and the sell of the Dec 220 Put. This can be advantageous at times because the net cost to do this as a single transaction you usually get a better deal than if you did them separately. When would I opt for this? If I just wanted to be done with the position and it's going against me and there is no time left for me to gain any money from it and it's just cutting my costs from further costing me more. I took some profits early this morning on CME and MA, but the rest of my positions, which all got filled for calls, ended up costing me money. My 4 yr old was sick today and stayed home and he was a huge distraction, constantly talking to me, wanting my attention. This did not allow me the time I needed to focus with so many positions on the table, to adjust for things going on. Yeah, an excuse. The damage would've been worse if I didn't manually stop myself out as most of my stops were too far. The plan was to wait to see what the market was going to do after all my positions were filled, which were within the first 5 minutes of trading - all automatic contingent orders. It is very hard to pay attention to things moving and going with a sick 4-yr old. It was already too late to undo my orders. As I was running around taking my daughter to school and managing Sean, I was not able to see the compression patterns that were developing for all my positions. Some were in pennants, others in rectangles. These were the costs I incurred today all on my cost positions. I had been away from the computer for about a 3 hr period and was surprised when I came back, which was around 3 pm EST. At that point, seeing all the positions that I still had on in negative, I panicked and just decided to cut my costs without reservation. Of course, within the next 15 min after doing this, apparently all these stocks had hit a support and began bouncing off support. Instead of licking my wounds and feeling sorry for myself, I said, "Oh well" and decided to get back in. I'm back in for everything except BIDU. MA is included in the mix where I was able to make money first thing on this before the stock started to tank. As I look at the chart, I'm amazed at even making money on a call position that began today, but I did. It wasn't a lot, just $200-300, but that will buy about 4-6 tanks of gas for me. MA, RIG, GRMN I'm currently at breakeven on my Dec calls. These will be short plays that I will most likely be out of by the end of Friday. The other stocks: CME, AAPL, GOOG, FWLT, FCX, ISRG I was able to get in as they were bouncing off support and each of those positions are nicely up in the last 15 min. of the trading day. It was good to see a rally. $SPX's range for the day was a 41 point drop from its high, but ended up closing about 7 points below the open. It's also at another pivot point. Will it go up or drop from here? Dunno. Have to wait until tomorrow, at least. Anyway, I'm going to post a bunch of charts in my next post without explanation. I don't have time to post my charts, as I have a commitment to get enough rest each day and I'm nearing the 11 pm sleep time. So, here are the brackets I've set up for tomorrow. They are all contingent OCOs. Half of these trades are Dec options and the other half are Jan options. For new readers, I tend to like high priced stocks that move. 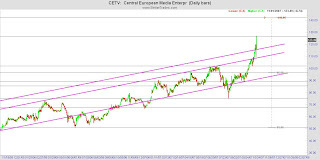 If you want me to look at some less expensive stocks, post a comment on which stock and I'll give a chartist analysis. Please no penny stocks. Okay, I got my blog template back. Still working on some of my links. Bear with me. Today the FOMC reports in 15 min. My stops are in place. I only have 2 positions in: RIMM and FCX. There has been a lot of major events going on with me in the past week plus, so I am trading lightly as my judgment may be impaired. I now have an accountability partner to help give me the extra edge that I need to get to where I need, to give me that extra umphf (sp? ), especially when my spirits are down. If I know others are watching or counting on me to be impeccable with my word, I'm more apt to follow through. For those who follow my blog, it seems like I'm forever apologizing about my sparsity in trading, but this is the way it is for awhile. When your life gets turned upside down, sometimes coming to right side up and back on course takes some time. Yes, it is taking weeks and months. But, this is real life for me, one trader doing the best I can with life stuff. This market, inspite of all my training, has created a level of fear for me. One can only take so many costing trades. You MUST manage your risk no matter how big or small your account is. Sure, you can bet the whole farm and if you profit, awesome, but that just reinforces bad habits. A part of managing risk is the size of your positions, what positions you take, the timeframe for your trades, the ability to attend to your trades, asking for inputs from those who understand your style of trading and perhaps can add an additional element to compliment your trading, setting stops appropriately. These are all a part of risk management. Speak your trades out loud. Tell your kids what you're trading, or your dogs, or a trading partner. When it's verbalized, there is something about the power of that that will help you gauge whether how you're trading is correct or not. One thing I'm finding is that I cannot sit and just watch the markets go all trading day long. That just makes me at times sick to my stomach or a high as a kite. It's like riding some thrilling, super fast rollercoaster. No thank you. Understand where your entries and exits are. For me, the best trades I make are when I'm calm and relaxed. Set your alerts or put in your contingencies to electronically go off. God has really put a lot of people in my path over these weeks to pray for my situation. I'm not talking about trading as much as I am about my personal life. Perhaps we want to say that our personal lives do not impact our trading, but I think the more "stuff" going on, it does. As I enter into a new phase of my life, the adjustments are many. It is requiring me to reach out to others for help, to ask for what I want, to be humble enough to do this. Many tears have been shed over my situation, and there have been times I wondered if trading is for me. I have been humbled by the market many times. In the past, thoughts of being able to beat it were always on the forefront, but from about 1.5 yrs ago, I recognized the market is always right and it doesn't matter what I think. To peacefully, profitably co-exist with the market is not a task that can be readily achieved just like that for the majority of folks, myself included. Anyway, I see the Fed's cut by 1/4 percent. If the cut was 1/2 percent, then would that mean there is greater concern for the economy than at 1/4 percent? I see the initial reaction to the news on the market is a drop. Sort of like a pressure relief valve. I'll just watch to see how it settles out. I screwed up on my blog template and can't seem to get back what I had. So, sorry for this new look. When I have time, I'll change it back. 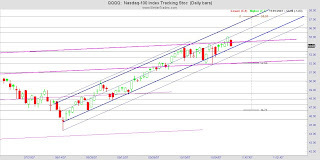 There is quite a bit of catching up I have to do with regards to my trading blog. I have been actively trading: VMW, RIMM, FWLT, AAPL, GRMN. Been taking smaller profits or cutting costs a lot quicker. It's been more like either daytrading or in trades for a little over a day. A couple of my trades have lasted a few days. No time right now to show some charts. I am around, just really busy as we roll into the holiday period. Been making strides in other areas of my life, just not as quickly as I'd like. Well, I got taken out of these 3 trades yesterday as my contingencies for trailing stops were hit. I chose not to get back in yet today and will wait until Monday as I had things going on that wouldn't allow me to watch the market. I was $0.25 off on GRMN, otherwise I would've been taken out of that trade, too. 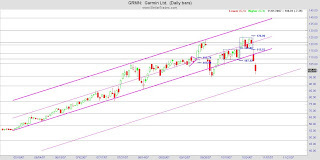 Today I reset a hard stop for GRMN at $105. Today is the 2nd day of testing. I expect 2-4 days of testing for this before resuming, so I may just tighten my stop on Monday to take profits, just in case it decides to pullback more. I can reload again at a better price. The 3 days seminar I was supposed to be at, I canceled. Attended the first day yesterday and the information was very superficial. They did talk about trading, but it was pretty lame. To spend 8-hrs not talking about anything that I could walk away with was not a good thing, so I chose not to go back. Plus, they would not allow me to have my laptop up during the seminar, which when they marketed for the class, they encouraged us to bring our laptops. I called and complained to the company and asked for a refund, which I will be getting in 7-10 business days. Perhaps if I have some time over the weekend, I will share a bit about a conversation between Ryan and I had regarding trading during volatile, indecisive markets and how to minimize damage. Though yesterday was a very bullish day in the market for many stocks, volatility remained fairly high, so that makes me wonder if the sentiment that we will be bullish for a little bit is very skeptical. I apologize once again for not posting very often. Many stocks were at compression patterns. Monday and Wednesday I got put into 4 trades (bullish) on RIMM, AAPL, GRMN, and VMW and these broke out of their patterns. I am in small, as the past 3 months of having been whipsawed a lot has left me feeling a bit drained. My trading coach was able to 1:1 encourage me, which helped me, as he was feeling it, too. Not that I'm happy about that, but made me feel as if I was not alone and that what I was going through that I was not alone. Since I'm taking profits in smaller increments in a volatile market, here are how I will play my positions. The bottom of this trading range is about $113. I would get back in if it stays above this (bullish). The bottom of the trading range is about $175, which would be another good entry point for bullish. If this pullsback, I'll get back in and reload. It's had 4 days up, so retracement is likely. With all these stocks, under normal lower volality markets, I would not do trailing stops at these locations and would wait until they get closer to their targets, but I cannot stomach all the whipsaws and am choosing to take smaller profits, which is better than costs. Today looks to have been a good day to trade the stocks I normally trade and I wasn't in the game. Darn. But, since markets have been fairly indecisive and I would be out getting necessary things done today, I was not willing to put on any positions and not be able to watch them. C'est la vie. Cash is still cash and there are more opportunities that await. Today I took a 1-hr teleseminar where the speaker spoke about NLP (neuro linguistics programming, I believe that's what it stands for). He talked about "money blocks". What are some of these things? Just to recap some of what was discussed, he talked about what we believe to be true can indeed be true, whether it is or not. We can choose to reframe our beliefs. Do I show up INVISIBLE? Is my UNcomfort zone too big? If I'm powerful, how do I effectively utilize that power? Do I deserve . . .? Do I compare myself with others? Am I disapointed in myself? What are my "false" beliefs about money? What is my relationship with money? Is it really hard to make money? Why can't I keep money? Can I make money work for me? He had us do a couple mental/physical exercises: 1) River of Quick Silver; 2) Circle of Power. Not really sure if I gained anything out of either of those 2 things, but it did give me ideas to use a different energy psychology method called Emotional Freedom Technique (EFT) on that I learned May'01 and have been using it on/off for the past 6+ years. It has been fairly effective with helping me break many addictions, phobia, fears, obsessions, bad habits. Though, I probably could've had greater and quicker success had I used a good therapist to better redirect me. Anyway, those might be some of my impedences. I AM a skilled chartist with really good risk management. But, subconsciously, there may be some things blocking me from experiencing the full potential of my trading. So, I'll explore. Tomorrow I will continue to practice trade, and still have a number of appointments and errands to run. It's better to take a few days off from trading than to force myself to trade and make mistakes. So, in reality, I did not miss any opportunities. My style of trading is more short-term or swing trend trading. Learning to successfully daytrade has been quite a challenge. Trend trading works great in trending markets, whether up or down. However, in indecisive, highly volatile markets, daytrading would be more appropriate, unless you want to sit on the sidelines. To say I haven't gotten beaten and bloody in the past 2.5 months, that would be an understatement. There have been some days that I honestly felt I didn't know anything about what I was doing and perhaps that I should just throw in the towel and go back to engineering, back to a career I absolutely hated. Then, I look at my children, how beautiful they are and how God has been so good to me to bless me with them. They deserve to have a mommy that doesn't give up and willing to work through this to be successful at this. For me, trading isn't about money and having "things". It's about freedom with my time, to have quality and quantity time. It's about freedom to be here for my children when they need me, to be able to be involved with their schools, in their lives, to know their friends and the homes they come from. It's freedom from the Corporate slavery and political BS of egos. Why can't I make a million in the next year? What's it going to take? How do I rise above the challenges in my life? Successful people make no excuses. They rise above their challenges no matter what. Something that has been occurring has been very humbling. To say trading has been easy is a total lie, because it hasn't been. You should see the bruises I've gotten. The market is no respector of people and it doesn't care that I want freedom with my time or whom I'm doing this for. I don't have to beat the market, just learn to peacefully co-exist with it. It's been awhile since I shared anything about my faith, so I will here. It's only by the grace of God that today I am still able to trade. Will I tomorrow or in a week? I have no idea. Live to trade another day is a motto my broker told me quite some time ago. Since then, I've heard and read it numerous times. 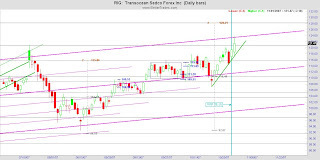 I've been successful in trend trading, but the markets have not been as good here for me, so as market conditions change, I must adapt my trading to meet changing markets. I'll take Monday to practice daytrading, which honestly, I have not done, but I have daytraded. Isn't that nuts? I broke a rule of my trading - never trade a strategy until I've successfully practiced it. Duh!!! Okay, so now I recognized I erred and am correcting it. Oh, back to my faith (sorry if this sounds ADDish. I'm not). God has really been working out my character, squashing pride and host of other issues and fleshing out the icky characteristics that are undesirable to Him. It's been so humbling. But, God is good, very good. Not only has trading been rough, but I've been hit in a number of other personal areas that have left me often crying out to God, asking Him when will all this pain end. Have I reached a "support"? Are we at a "morning star"? I hope so. The past couple weeks, God has been teaching me about community, true community. Many friends from all over the world, my church, my family have reached out to help me in various areas of my life to help me through these times. THESE things impact my trading. Many tears have been shed, but this weekend, I got to shed some tears of joy. My spirit has felt very beaten, but my physical body needed refreshment. Some people have reached out to me in some very practical ways to help me, to serve me, and I am so grateful. So, there is now a little more energy, hope, and I'm once again getting back on the horse, being focused. No matter what. No matter how great of a chartist I am, God ultimately is my Provider. The stock market is just a tool in His Provision. I have great hope in God, but that is not the same "hope" that I talk about in trading. I do not trade on hope, rather what I see on the price chart. God equips me to be able to read the price chart. So, I will put for the work, but it will be God that helps pave the path to help me to stay focused, to fight and champion the giants in my lives so I can successfully trade. It's a teamwork thing and He wants my cooperation. God is extraordinary, so amazing. I truly love trading, and I believe God has given me a gift to do this. I also believe He helps me to be able to explain things in a fairly easy manner, and to relate. Anyway, it's getting late and I need to hit the sack. God bless you all. 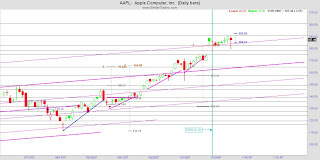 AAPL: So, which direction is AAPL going to take? I have no clue. So, I'll set a blue bracket and see what the stock does. I've been able to take profits this last week as well as have some costs here. Those tails whipsawed me. Pivot areas: 167.25 and 163.50. Why did I convert this to a line graph? The pattern the S&P looks to be potentially trading into a W pattern. Until it passes through the midpoint, there is no confirmation of a bullish sentiment. As you look back at the recent pasts with the W's, M's and Head & Shoulders, the S&P seems to be following these fairly well. This is a closer view of what is happening now on a daily basis. People say we are heading into a bear market, but really, are we? The markets ARE indecisive, but it's not like we haven't experienced this before. Look back at the history. My charts are a bit out of order. This chart of the S&P is on a WEEKLY timeframe. Note the great indecisiveness of the market in 2000. Could it be repeating now? Just a thought. This is the overall pattern of the uptrend of the S&P as it works to figure out now what it wants to do. It's still trading within its uptrend. It really could fall to the 1400 range and still be in an uptrend. With all these charts, what do I see for pivots for the S&P? A W pattern (and it's not confirmed yet) with the right support higher is a stronger bullish signal. But, once again, in neutral trading, keep my opinions out and let the market do what it wants to do and just go with the flow. My bracket is set at 1463 & 1455. Downside pivot points: 1439, 1430, 1407, 1397. Those would be the pivot points if you are trend trading. I apologize for not really posting much to my blog. Life has been very busy as I continue to work through my situation. What has trading been like? Since I'm a trend trader, that should probably tell you some about how this indecisive market is impacting me. I've had profitability, but many more costs and have been whipsawed many times. It's left me feeling a bit beaten, bloody, and discouraged. Though this week has been net profitable for me, it hasn't been without its scars. So, today I decided to take the day off and just workout, spend it with my kids and relax. Will post some charts later this weekend of things I'm looking at. 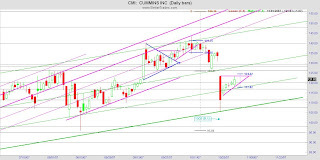 CMI: Today was a good entry for CMI, but tomorrow can be another 2nd entry. See chart for targets for the upside and downside, bracket. All my indicators look very bullish, but it's best to trade neutrally. 1 strike OTM options for Dec are at a bargain. RIG: It's broken out of the major & minor resistance of the trends it has been in. Today would've been a good entry for both, but if not, a bracket is set. It is a blue bracket which means those are pivot points and depending on what is happening at those points, you would get in. Upside target @ 140. 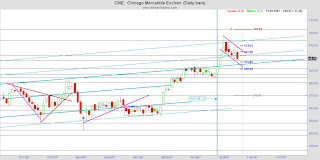 Downside target @ 114.50. Which options? ATM if it goes through 130, Dec130C = 6.10 x 6.40. Fair Value = 6.54, so the options are fairly priced. This price is at 129.64. If the stock comes back and bounces off 127 to the upside, the Dec130C will be less by $2-3. 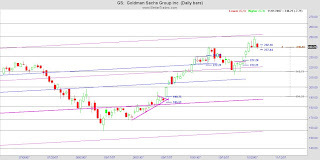 If the stock goes down through 127 to the downside, Dec125P = 3.60 x 3.90. Fair Value = 4.02. Options are at a slight bargain. This price is @ 129.64. GRMN: Looks like it's coming off support. Today would've been a better day to get in. If it decides to pullback and bounce back up, there are 2 brackets, depending on what it does. See the lines for the targets. ATM option pricing for Dec are at a slight bargain. VMW: This also is a blue bracket. The traders for VMW are very disciplined. Since it's also in the middle of the trend trading range, use caution. My indicators say bearish, but I would play this neutrally. ATM options for Dec are fairly priced. AAPL: Of these 5 stocks, AAPL is my least favorite because of where it's at. It just broke above the 190 resistance, so that is a good sign. However, my indicators of MACD, RSI, Stoch show it's overbought. However, it can continue to be bullish. The rest of my indicators seem bullish. Upside Target @ 201. Downside Target @ 178. Within it's trend, it's sort of in the middle, which I would prefer it to be at support or resistance of the trend. Dec APPL options for ATM are bargains - wholesale. So, of these 4 stocks, AAPL and GRMN ATM Dec options (both calls and puts) are at bargains. AAPL being more of a bargain. VMW and RIG are fairly priced, so not at a bargain, but also not retail. I'm just putting down a bunch of charts that I have marked up. If you've been following my bracket trading, then you should know where I have set entries for new trades. All orders are contingent. I have not placed any stops on my chart, but there should always be stops once entry orders have been filled.